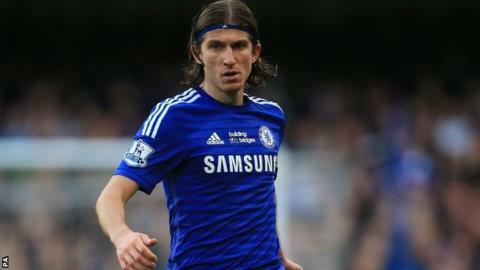 Chelsea full-back Filipe Luis has rejoined Atletico Madrid, one year after his move to Stamford Bridge. The Brazil international, 29, made 26 Blues appearances, winning the Premier League and the League Cup, but has signed a four-year deal to move back to Atletico for an undisclosed fee. Chelsea paid Atletico £15.8m for the defender last summer. The Blues have been linked with Augsburg and Ghana left-back Abdul Baba Rahman, 21. Atletico sporting director Jose Luis Perez Caminero told the club website: "We all know Filipe Luis. We will be stronger with one of the most talented wingers in the world. He already knows our club and our way of playing so he will adapt quickly." Meanwhile, Atletico have loaned full-back Javier Manquillo, who spent last season with Liverpool, to Marseille.